It’s been a fabulous October so far: super sunny days, crisp air, blue skies, and rainbow leaves falling everywhere. But, like all good things, perfect weather can’t last forever and we’ve been getting more and more rain. I love rain (especially when I’m inside) and when it’s raining, it’s like the world is begging me to make a big pot of soup. It’s the perfect excuse to stay in, cozy up with a book and smell the soup simmering. 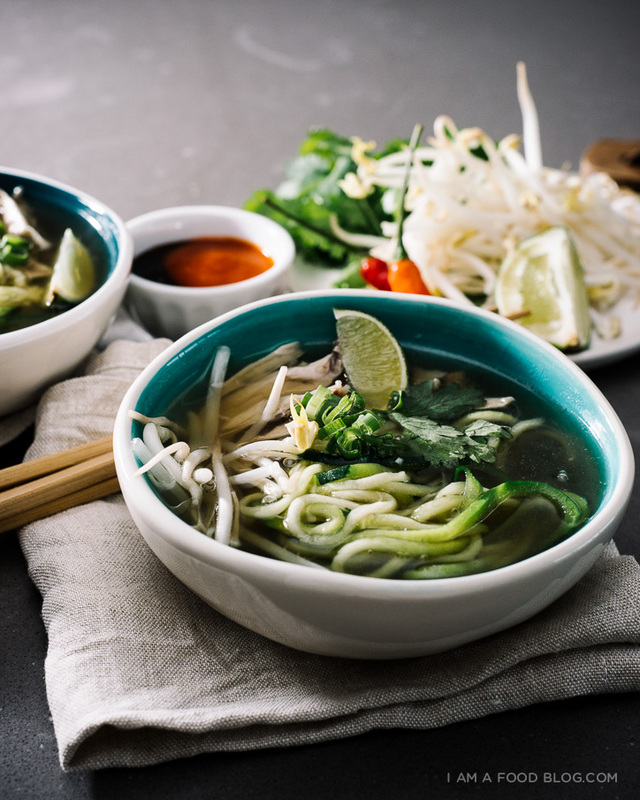 Pho is my go-to soup to make. When I’m feeling particularly industrious, I’ll pull out my biggest pot, make a huge batch and freeze the stock in individually sized portions. That way, when the pho-craving hits (as it does so very often), I just need to head out and buy myself some noodles, meat, and herbs. This time though, I decided to play around a little bit and make some zucchini noodles. I’m a big zucchini fan so it wasn’t much of a stretch for me to imagine what zucchini noodles would taste like in pho broth, but Mike wasn’t totally convinced. Nonetheless, I whipped out my vegetable noodle making machine and went to town. A light blanch in some hot water and the zucchini noodles were a perfect stand in for rice noodles. Just make sure you’re barely blanching when cooking the noodles so that your zucchini still has lots of bite. You basically want them to be barely kissed by the hot water. They’ll soften up a bit in the pho broth, so don’t worry about them being too al dente. This was one of those experiments that went really well. Even Mike ended up liking the zucchini noodles! We had a whole discussion on which would be cheaper, rice noodles or zucchini. I was team rice noodles, but he thought zucchini would be cheaper. It was too bad that I didn’t have the foresight to buy more zucchini because when we finished our bowls, we were both still craving move. Lesson learned: when making zoodles, stock up on the zucchini! Toast your ginger and onions in a toaster oven or oven on broil until the onions are sweaty and everything is nicely charred. Peel the ginger and onions and set aside until you’re ready to start your broth. 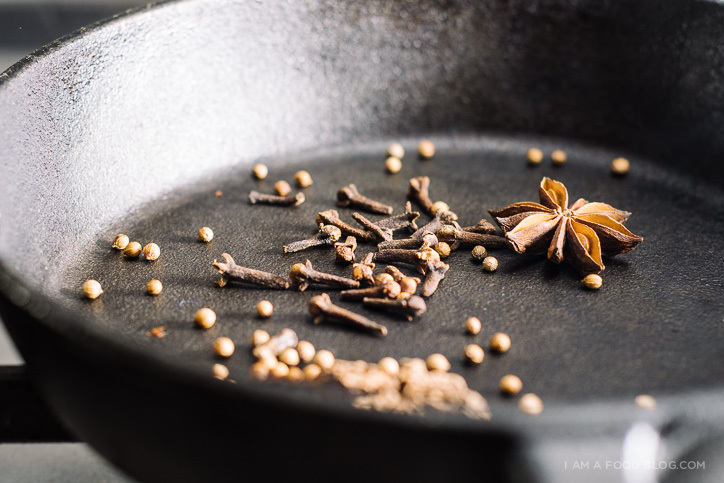 Toast the coriander seeds, cloves, and star anise in a dry pan on low heat until they are aromatic, about 2-3 minutes. Tie the spices up in cheesecloth for easy removal from your soup. Fill a pot with about 2.5 quarts of water and add the chicken legs, ginger, onions, cinnamon stick, and spice packet. Bring to a boil and lower to a very gentle simmer. After one hour, remove the chicken legs, let cook and shred the meat off the bones. Place the bones back into the broth. Set the chicken aside in the fridge. Continue simmering the broth with the bones and skin. Simmer for as long as you can; reducing it will intensify the flavor, minimum 2 hours. After 2- plus hours, strain the stock and discard the solids. Skim the stock if needed. Keep the stock hot over medium-low heat and season with fish sauce and sugar. Add the sugar and fish sauce in increments until you’re happy with the flavor. Bring the stock to a roiling boil. If using zoodles, blanch briefly in boiling water. If using pho noodles, prepare your noodles according to the package and strain. Place zoodles/noodles in a large bowl. Add a generous amount of chicken (the stock should heat the meat up enough, if you want it piping hot, dip it into hot water to heat), top with broth, and garnishes. Enjoy! Notes: If you need some zoodle making tips, check out Ali’s site! I made my noodles using the Paderno Spiral Vegetable Slicer. 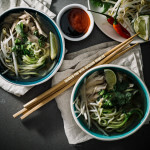 I love pho, but I’ve never tried making it myself. The process had always seemed intimidating to me but this doesn’t sound to tough at all! 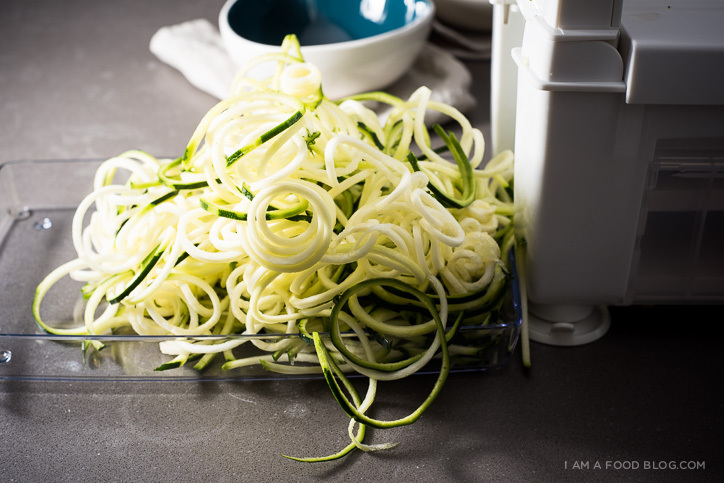 I love the addition of the zucchini noodles – I don’t have a spiralizer but I do have a julienne peeler that works pretty well. Definitely going to give this a try! I will always be a real noodle person over vegetable noodle eater; but when you give it such a good rap I have got to give it another chance. Reading this post has me craving noodles at midnight. 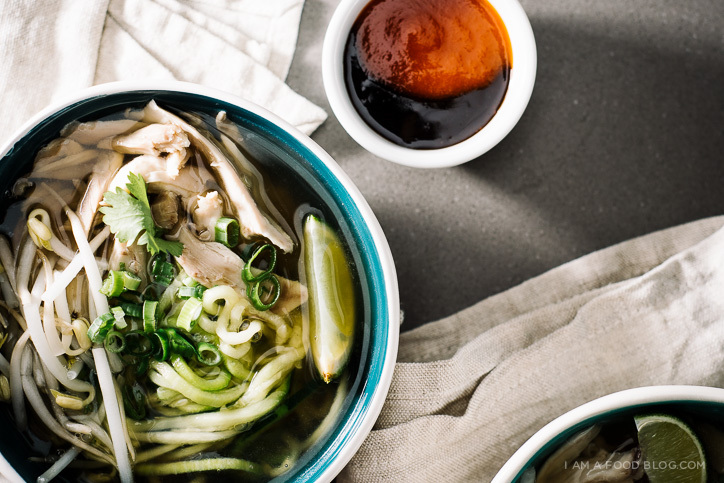 okay, the zucchini noodles in an asian broth sound amazing! i’ve only had zucchini pasta in pasta-flavoured dishes. This looks so good. I am trying to get my health grind back, and will definitely be making this. I don’t have your super cool vegetable noodle maker but I have a Veggeti and this totally looks doable at my house. Fall is the season for soup so I’m uber excited to try this! You mention a cinnamon stick in the ingredients, but it’s never mentioned in the instructions! I assume you toast it with the coriander, cloves and star anise? thanks! i fixed it. you don’t need to toast it, you just add it to the stock. No prob! Love the site and the cookbook! This loooks pho good. Phogeddaboutit. Ok, I’m done with the pho puns. 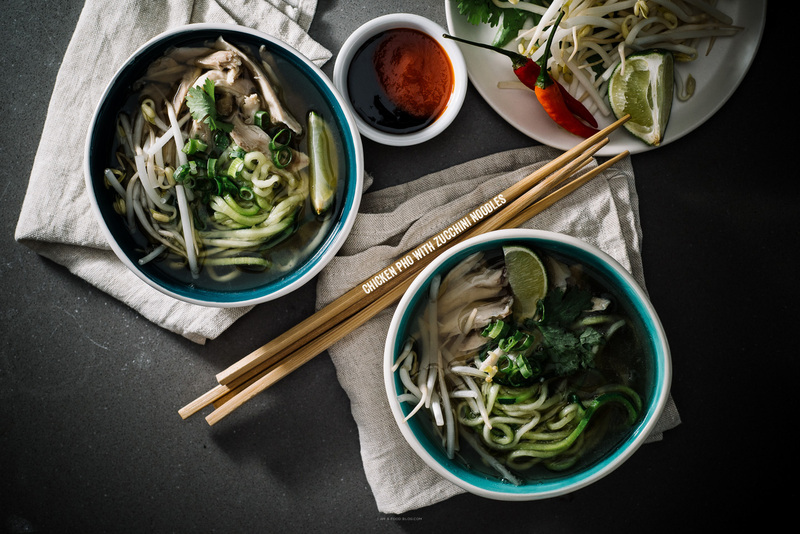 But really, I’m making this for dinner, because I love this idea so much and I’m crazy for Pho! I have been meaning to make pho for a while! I can’t decide if I would like regular or zucchini noodles better, but you’ve definitely made a good case for the zucchini noodles! OMG yes. After about two months of sitting in a box, my spiralizer has recently come out to play and will come out even more thanks to this recipe! Zoodles and Coodles (that sounds weird–carrot noodles?) are a new favorite in our house! I got mine at Williams Sonoma. I’m still pretty enamored with the thing, so it was definitely a worthwhile investment for me. Gosh, I love this dish. PLUS it reminded me of a zucchini I have in my fridge—the last out of my garden—that I have to use. Thank you!!! Thank you for this recipe! I’ve been on the hunt for a chicken pho recipe ever since having it at this incredible Vietnamese hole-in-the-wall but I think their’s had tomato in it. Have you ever tried that? This recipe looks great! Your pictures look so good!! I’d thought about trying zucchini noodles in pho before, but was afraid the heat would turn them to mush. I’ll definitely have to try it now that you’ve tested it for us. Also, I like how simple your recipe sounds. 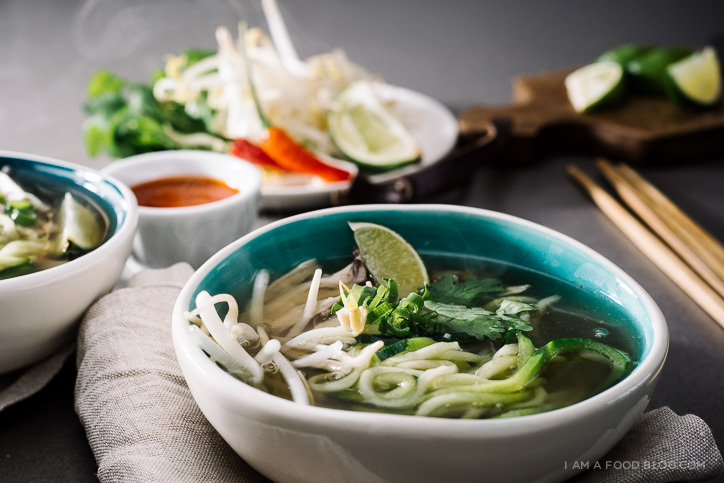 The one time I tried to make pho myself, it turned out rather disappointingly and I thought I’d have to leave it to the professionals. Think I’ll give it another go with your recipe. PHO!! This look so delicious! Admirable food photography.